1. Cut the lemon grass stalks in half lengthways and thinly slice the ginger and chillies. Place in a large pan with the lime leaves and chicken stock, bring to the boil then add the chicken and simmer gently for 5 minutes. 2. Meanwhile, separate the pak choi leaves and slice the salad onions. 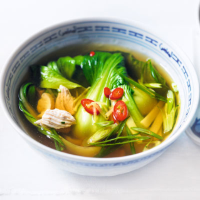 Drain the bamboo shoots, add to the pan with the pak choi and cook for 2 minutes until the vegetables are tender and the chicken is cooked through. 3. Remove the lemongrass, add lime juice to taste, then stir in the salad onions. Ladle into bowls and serve.